This idyllic spacious, fully modernised, cottage is set in the Village of Kingsteignton, close to all local amenities and just a few minutes walk for the local primary school. UPVC double glazed, and GCH. Ideal family home. Fully modernised throughout this cottage is a must see to appreciate all it has to offer. Fitted shelving either side of an exposed fire place, housing a log burner, carpeted, wall lighting, radiator uPVC double glazed window to the front, half white wash wood cladding and plastered walls. 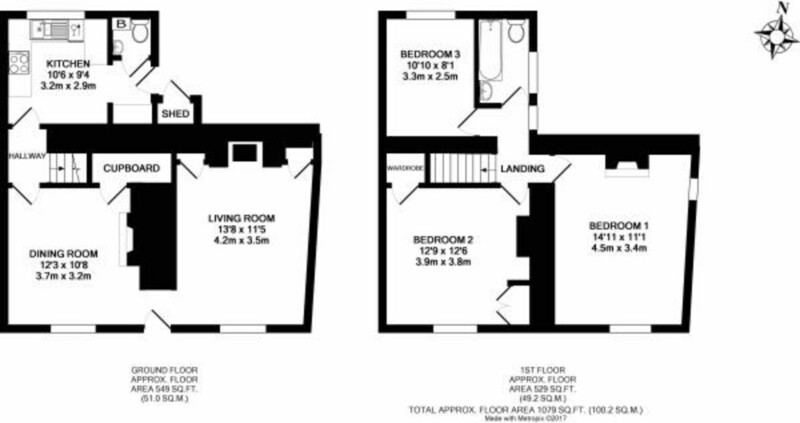 Double room with two storage cupboards/wardrobes, radiator, pendant light, uPVC double glazed with to the front. Double room with pendant light, feature fireplace, two double glazed windows to the front and side, exposed beams, radiator. Good size single room with pendant lighting, radiator and uPVC window to the rear. Newly laid tarmac allowing parking for two vehicles and potential for a carport space. This idyllic spacious, fully modernised cottage is set in the Village of Kingsteignton, close to all local amenities and just a few minutes walk for the local primary school. It is UPVC double glazed, GCH and off road parking. An ideal family home; this cottage is a ‘must see’ to fully appreciate all it has to offer.